One of the first bands many people name when listing influential death metal bands is Behemoth. Hailing from Gdańsk, Poland, the band was formed in 1991, and they’ve been relentlessly writing and touring since, evolving their sound as they go. And on Sunday, May 1st, they performed at The Granada in Lawrence, KS, to a packed and appreciative house. Only one opening band tagged along for this trek, a Danish performer under the moniker Myrkur. Frontwoman Amalie Bruun writes and records all the parts except drums by herself (although her live backing band is quite excellent), and the music she creates is certainly unique. 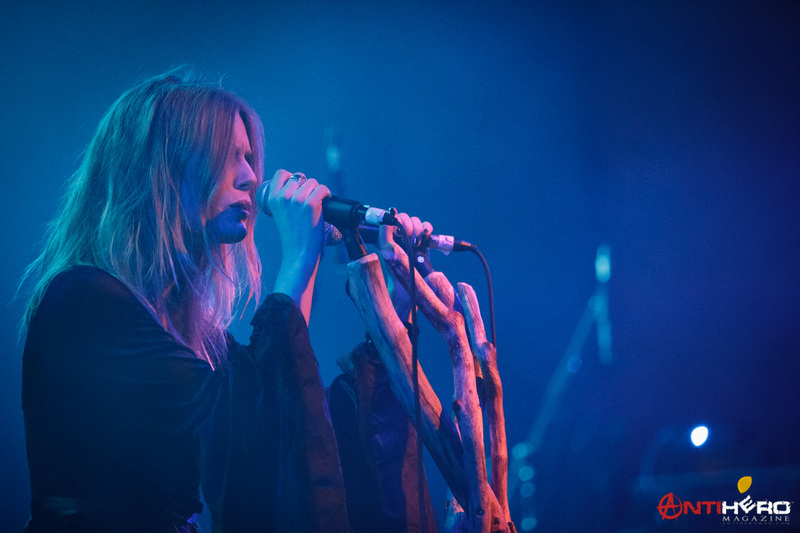 A thick, doomy mix of black metal and European folk metal – actually not as rare a genre as you might except – Myrkur‘s songs were all about texture, featuring a predominant mix of clean, soaring vocals that wouldn’t feel out of place on an Enya song, but occasionally switching to possessed screams that pierce the ears and would be downright unsettling if they weren’t so beautiful. The backing music was never bright or cheery, but due to the folky influences, never felt particularly brutal, even with the drums hammering out blastbeats and the guitarist’s speed-strumming abilities put to the test. Behemoth‘s most recent album, The Satanist, is the sort of album that will be talked about in 20 years as a classic, the type of album that influences the entire genre and reshapes it for years to come. As a treat to fans, the first part of Behemoth‘s set on this tour is playing that entire album live. Unfortunately, the live experience doesn’t quite measure up to the recorded version. There are multiple reasons why The Satanist did not translate as well to a live setting. For starters, many of the songs share musical themes and similarities which get repeated throughout the album, but much of the nuance was lost in a subpar sound mix. The lead guitar was turned abysmally low, and vocalist Nergal was often buried under the rhythm section during the more intense moments. Another factor that brought it down was the lack of actual riffs. Once again, the poor sound mix emphasized this, as the intricate lead runs were drowned out, leaving most of the set a fairly atonal drone – the two exceptions being lead track “Blow Your Trumpets Gabriel” and the incredible “Ora Pro Nobis Lucifer,” which had the entire crowd screaming along and a meaty, straightforward, powerhouse riff driving the song forward. The second half improved a bit. Bouncing between albums and styles helped the songs with more traditional metal riffs pop, and the more experimental, blackened songs to breathe on their own. “Antichristian Phenomenon” and “Pure Evil And Hate” were both memorable standouts, especially after the first half of the evening seemed so stale. Still, with 9 of the 15 songs being from The Satanist and 7 of those falling pretty flat, it’s hard to endorse this particular tour. If they can fix their sound issues and/or play a more varied set, that would be another story. Check out the Photo Gallery from the Behemoth show here!